France has a striking diversity of landscapes, from the snowcapped peak of Mont Blanc to the deep blue seas of the Mediterranean. Every region offers inspiring hikes, with trails ranging from easy to advanced, that are sure to impress. 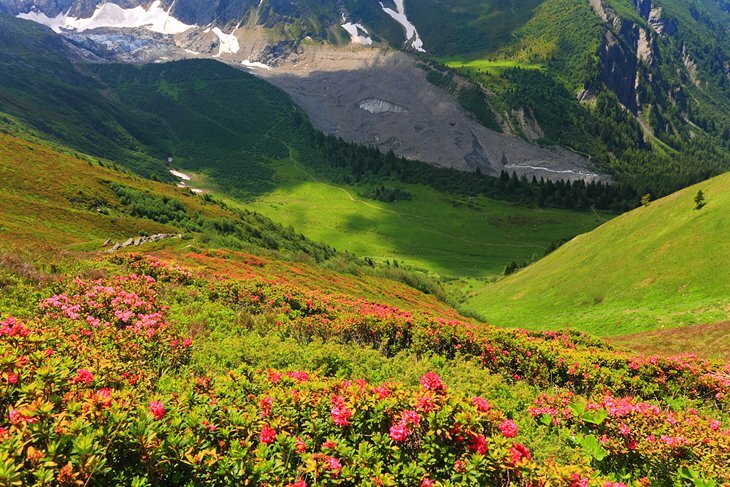 Be awed by the alpine scenery in the Chamonix Valley while hiking past glaciers and wildflowers. Amble the country lanes of Alsaceto discover storybook hamlets nestled in the rolling hills, or walk from one ancient hilltop village to another in the rugged Luberon Mountains of Provence. Modern-day pilgrims can follow in the footsteps of medieval Christians on the Camino de Santiago trail in the Pyrenees, and history buffs can trace the WWI battlefield sites along the Normandy coast. For the most dazzling seaside panoramas, hike from the beautiful perched village of Eze on the French Riviera to the peaceful beaches of Eze-sur-Mer. One of the most legendary trails on the list is the GR20 in Corsica, but it is only advised for well-trained hikers, whereas anyone could enjoy the gentle nature walk at the Cirque de Gavarnie to admire soaring granite rock walls and marvelous waterfalls. The snowcapped peak of Mont Blanc is one of the world’s most spectacular nature sites. At an altitude of 4,810 meters, this legendary mountain is the highest peak in Europe. Many climbers dream of conquering this mountain, but ascending to the top is extremely strenuous and requires exceptional fitness as well as a guide. However, Mont Blanc is not just for mountain climbers. It is possible to find moderate sections of Mont Blanc that can be approached as short hikes. The Tour du Mont Blanc is a system of hiking trails that covers 170 kilometers of the mountain, with many different starting points including Courmayeur, Les Houches, and Chamonix. All trails feature mountain huts along the way where hikers can stop to rest and get refreshments.